check the latest MO-AM news, event and industry gossip! Romeo Miller know as lil Romeo and Master P’s son has become his own man!!!! Dame!!!!! I remember when i was in school saying this guy is gona grown up and be hotter than Bow Wow!! and i was sure right!!! UK TALENT JESSIE J IS ON EVERYBODYS LIPS!!!!! Jessica Ellen Cornish known as Jessie J is an English singer/songwriter, currently signed to Lava Records, and Universal Republic Records. With her first BOLD single ‘Do It Like A Dude’ she wrote it and was going to be given to Rihanna but decided to keep it, and use it as her self was a great idea, as she has caught everyone’s attention, now she has set the mark for herself and i can’t wait to see some more of her work!!!! The next single will be ‘Price Tag’ featuring B.O.B, so keep an eye out for the music video!!!! It’s been a year since they lost out to Alexandra Burke during the X Factor final, but boyband JLS proved they are more popular than ever as they performed in Manchester over the christmas. 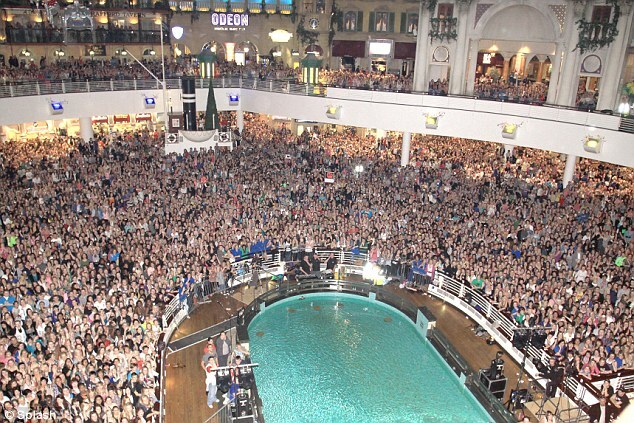 Thousands of screaming fans turned out to see the group as they turned on the Christmas lights at the Trafford Centre. The venue had to be shut down at one stage as more and more fans crammed inside. Well done boys hope things are even bigger next year. Not too long ago Janelle Monáe lit up the stage at the O2 Shepherds Bush Empire – performing a number of hits including ‘Tightrope’ and ‘Cold War’. It seems the rising star can’t get enough of the UK, as she’s confirmed a UK tour for early next year. The ‘Tightrope’ singer will be dancing, singing and tightropin’ across dates in February and March. This will be great news for her fans who didn’t get to see her yesterday, as the show sold out in hours. This girl is defiantly an artist to look out for in 2011!!!! Shes got balls!!!! lol no seriously she comes across brave, unique and loud!!!! with some crazy faces too!!! she is a character, maybe the Lady GaGa of pop/r’n’b!!!! we will have to wait and see!!!!!! Check her out in East London’s XOYO signing live!!!! The Don of all cinematic film scores and movie orchestra Hanz Zimmer. This guy has provided movie soundtracks for Dark Knight, Sherlock Holmes, Inception just to name a few big blockbusters and even Video Games such as the World Wide Award winning Call of Duty! You can’t help but be captivated but his musical talent! For me you can’t do without music in a film standard. Truly a guy who is on top of his game! Check out Part 1 of his interview… the rest check youtube and go check out his soundtracks ESPECIALLY INCEPTION!!! Yo you gotta click play and watch this i think its overly cool, very creative and there is actually more to come. Nice this type of thing keeps me motivated to come up with some sick ideas! MO-AM is an Online media production company, soon to be young lifestyle Entertainment TV blog network in mid 2011. Covering Music, Entertainment, Fashion and much more.